I have got to this grand old age without ever having tried kale, now it's not because I have an aversion to vegetables, quite the contrary. Somehow it has just never been in anything I've ordered at a restaurant, and my mum never cooked with it when I was growing up. There was a special offer on a giant bag of the stuff in the supermarket the other day and I went out on a whim and bought it. I had to look up how to cook it in order to get some inspiration, I settled on cooking some onion and garlic in a pan and tossing the kale through for a few seconds at the end and then mixing it with some cous cous in an attempt to make myself a quick and healthy dinner. Whilst waiting for the onions to cook I was nibbling the kale from the bag raw, it has quite a distinct flavour, not too dissimilar to cabbage in my opinion, not at all unpleasant and I will continue to look for good recipes for this leafy green veg, if you have any good tips for cooking with kale feel free to comment below and let me know, just one word to the wise, I'm not really keen on making kale juice though. Just in case you thought that would be a good suggestion for me, for some reason every time I have seen someone on TV drink it, they have not been impressed. That puts me off! Kale crisps! Healthy alternative to real crisps! Also add kale to any soup at the end and let it cook 4 - 5 mins. Sweet potato, chorizo and kale soup = amazing! Bread - I once pureed kale and added to a gluten free bread mix - green bread! 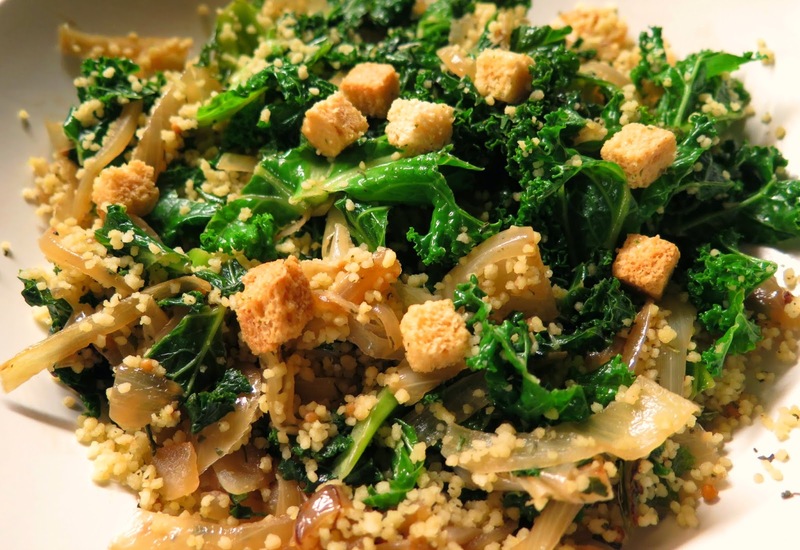 Go all retro and make a kale and quinoa risotto - either as a main dish or as accompaniment. Kale is so versatile. Also so high in iron, vitamins & calcium. It's a shame more ppl don't use it. So many times when I'm buying it I'm asked if it's to feed my rabbits. Forget the rabbits and get eating it yourself I say - they don't know what they're missing!